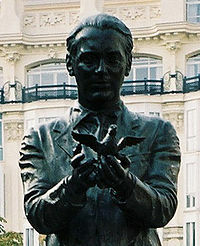 The Daily Mail has been in the news for its attacks on Ralph Miliband as “the man who hated Britain“. This continues a long tradition of smearing “Red” Ed Miliband by association with his father’s politics (here, for instance, in 2010, they make a big deal of the fact that his elderly cousin, who he may not even have met, had some vague connection to Joseph Stalin half a century ago). I don’t normally comment on topical events on this blog, but this seemed kind of worth looking at. The sole piece of evidence presented by the Mail of Miliband Sr’s “hatred of Britain” is a diary entry he wrote when he was 17. I pity my son, if he ever becomes a public figure and the Mail finds what I wrote in my diaries as a teenager… I would much rather trust his son’s memories to know anything about what the mature man actually felt about the land that gave him refuge when he fled genocide – and the land for which he served in the armed forces. However, I’m fairly sure that despite his lack of British nationality at this point, he served in the mainstream Royal Navy and not in the Section Belge (RNSB). The latter operated corvettes (such as the one picture above) and minesweepers, while Miliband served on destroyers and warships. Was Miliband a Communist Fellow Traveller? At the London School of Economics, he was taught and heavily influenced by the extremist Left-winger Harold Laski, who said the use of violence was legitimate in British elections. 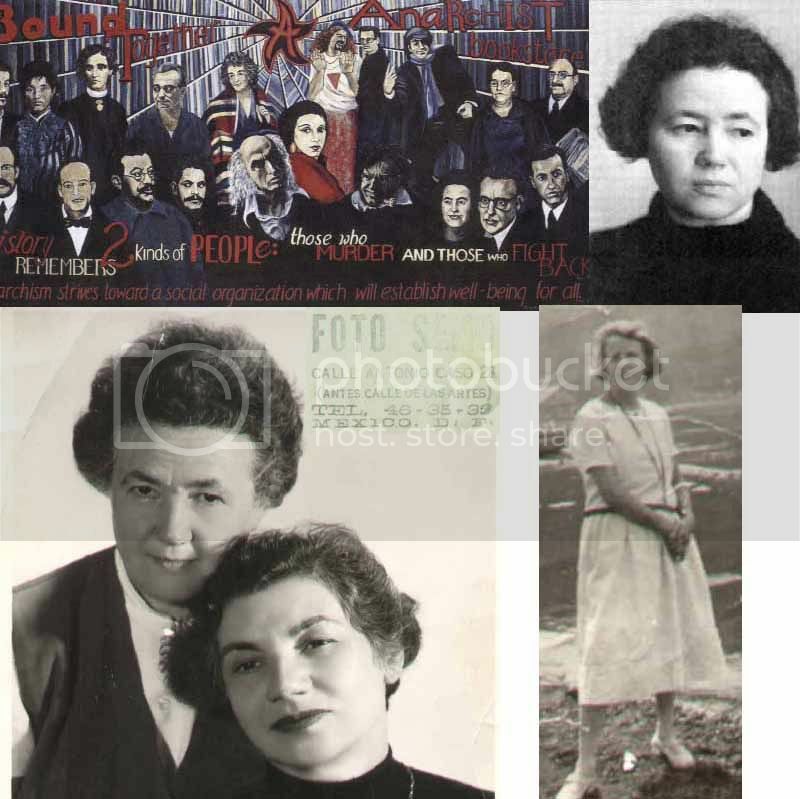 Only in the 1930s, during the tumultuous years of the Depression, did Laski start to flirt with a pro-Soviet position, and come to believe that the overthrow of capitalism might not happen peacefully. Even in this period, I am fairly certain, he never said “the use of violence was legitimate in British elections”, as the Mail claims. During 1931-1937 Laski was a key figure in the Popular Frontist movement in British politics, influenced by Laski’s friend Leon Blum in France. This movement, including Stafford Cripps and focused around the small middle-class Socialist League, as well as the more broad-based Left Book Club, sought rapprochement between the Labour movement and Communism, with the priority of defeating fascism. This movement was largely rejected both by the working class mainstream of the Labour Party and by the uncompromising anti-Stalinists of the Independent Labour Party, and Laski skunked back to Labour in 1937, increasingly settling in on the soft left of the party. After the war, Laski did continue to argue for a more positive attitude towards Britain’s war-time Soviet allies and against the Atlanticist Cold War consensus in the Labour Party, but he no longer endorsed Communism as a viable political movement in Britain. It was this later Laski who would influence the young Ralph Miliband, who studied under him at the LSE briefly during the war and then again after his demobilisation. This more mellow Laski encouraged Miliband to think for himself and question Marxist orthodoxy. 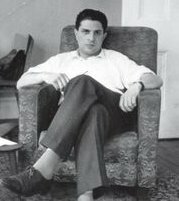 Ralph Miliband has been described as a “Stalinist”, which is a complete travesty considering his consistent opposition to the Soviet model of socialism from above. Back in Poland, Ralph Miliband’s father had been a Bundist, a fiercely anti-Stalinist Jewish socialist movement. As a youngster in Belgium he joined the Zionist youth group Hashomer Hatzair, which was affiliated to the British Independent Labour Party, and again anti-Stalinist. The invasion of Czechoslovakia show very well that this oppressive and authoritarian Russian socialism has nothing in common with the socialism that we demand,and we must state this very loudly, even at the risk of seeming to be anti-soviet and to echo bourgeois propaganda … And then, there is also this question of ‘bourgeois liberties’ … which, I am persuaded, we must put at the top of our programme. Or rather, denounce them as insufficient and to be extended by socialism. Nothing will work if it is possible and plausible to suggest that we want to abolish them. And that is one of the reasons why the democratization of ‘revolutionary’ parties is essential… The internal life of a revolutionary party must prefigure the society which it wants to establish – by its mode of existence, and its way of being and acting. While this is not the case, I don’t see any reason to want to see the current parties take power: they are quite simply not morally ready to assume the construction of a socialist society. His anti-Stalinism was less robust than, for example EP Thompson‘s became or that of the International Socialists, and there is a still a lingering presence of the Laski-ite fellow traveller in his sense that “seeming to be anti-soviet” might be a bad thing, but he was always clear that Soviet “socialism” was oppressive and cruel. Mikhail Gorbachev’s dismantling of Soviet socialism and the worker state should have shocked Miliband, but he managed to find an argument welcoming it. He proclaimed that the Cold War had always been a useful ‘bogey’ for the Right, and that, ‘the success of Mikhail Gorbachev in democratising Soviet society . . . would deprive conservative forces of one of their most effective weapons’. In recent years, Mikhail Gorbachev has sought with great eloquence to define the kind of internationalism which the world requires today, and has done so in terms of universal values and aspirations, beyond boundaries of nations, classes and creeds – values and aspirations relating to peace, disarmament, the protection of the environment, and so on. These are indeed universal values, and socialists obviously subscribe to them. Such celebration and proclamation is, however, rather premature. Soviet-type Communism, with the centrally planned command economy and the monopolistic one-party political system, is out or on the way out, and will not be resurrected. But the notion that this is the end of socialist striving and eventual socialist advances leaves a vital fact out of account. This is that, despite the current apotheosis of capitalism, it has resolved none of the problems which give sustenance to socialist aspirations and struggles. Given the inherent and ineradicable failings of capitalism, there is no reason to doubt that the striving for radical alternatives will continue. Miliband was wrong to see that the Soviet regime ever (except perhaps briefly in the last two months of 1917) represented any kind of hopeful alternative to Western market capitalism, but he was always a sharp critic of its oppressiveness. And what about the Daily Mail? This was the immigrant boy whose first act in Britain was to discard his name Adolphe because of its associations with Hitler, and become Ralph, and who helped his father earn a living rescuing furniture from bombed houses in the Blitz. Lord Rothermere was a friend of Benito Mussolini and Adolf Hitler, and directed the Mail’s editorial stance towards them in the 1930s.Rothermere’s 1933 leader “Youth Triumphant” praised the new Nazi regime’s accomplishments, and was subsequently used as propaganda by them. In it, Rothermere predicted that “The minor misdeeds of individual Nazis would be submerged by the immense benefits the new regime is already bestowing upon Germany”. Journalist John Simpson, in a book on journalism, suggested that Rothermere was referring to the violence against Jews and Communists rather than the detention of political prisoners. Rothermere and the Mail were also editorially sympathetic to Oswald Mosley and the British Union of Fascists. Rothermere wrote an article entitled “Hurrah for the Blackshirts” in January 1934, praising Mosley for his “sound, commonsense, Conservative doctrine”. This support ended after violence at a BUF rally in Kensington Olympia later that year. Rothermere, as late as 1939, wrote to Hilter congratulating him on invading Prague, and urged him to march on Romania. On October 25th 1918 Jack , together with Sam Lipman and Hyman Lachowsky, was sentenced to 20 years hard labor and fined $ 1000 on charges of “anti-American activities.”, whilst Mollie Steimer received fifteen years and a $500 fine… In mid-1919 was filed an appeal, and in the meantime Jack and the others were released. we should be eternally vigilant against attempts to check the expression of opinions we loathe and believe to be fraught with death, unless they so imminently threatened immediate interference with the lawful and pressing purposes of the law that an immediate check is required to save the country. The best test of truth is the power of the thought to get itself accepted in the competition of the market, and that truth is the only ground upon which their wishes safely can be carried out. “That at any rate is the theory of our Constitution. Anyway, the group tried to escape to Mexico but got waylaid and some went to Russia, where (ironically, considering the defence of the revolution had got them locked up) they witnessed the deepening repression of the Bolshevik state, and before long were deported from there too. Eventually, in 1926, Mary and Jack Abrams wound up in Mexico, in Cuernavaca, not far from Mexico City, where he joined a group of Spanish anarchist exiles, Tierra y Libertad (Land and Freedom). Creative Commons License. Photo from the Triangle Fire Open Archive. Contributed by David Bellel. Circa 1930s. 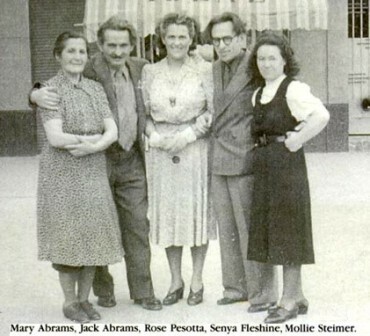 Photo shows Mary Abrams, a shirtwaist fire survivor, with her husband Jack Abrams, Rose Pesotta, Senya Fleshin and Mollie Steimer. The picture was taken in Mexico in the late 1930s where the group lived in exile (except for Pesotta) as a result of the Palmer Raids of 1919. At that time Mary was part of the anarchist Frayhayt group. Mary passed away in 1978. Source: Jewish Women’s Archive. They retired to Cuernavaca in 1963. My first remembrance of the many visits we made to Mexico City is from 1945, when I was nine. As others were gathering in Times Square to celebrate the end of World War II, we saw the giant parade that wound through downtown Mexico City. Abrams took me to the major sites and to children’s films, willingly spending hours with me while my parents went off to experience Mexico’s revolutionary culture. 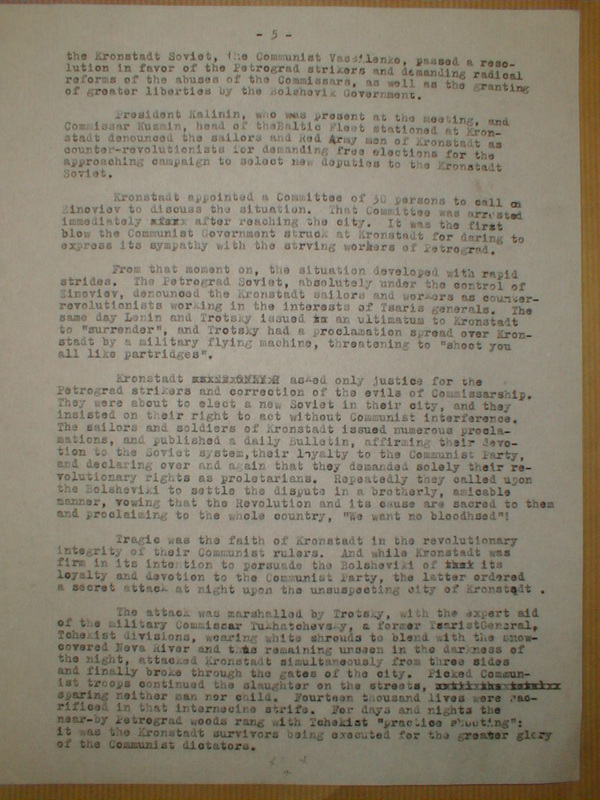 In a later visit, either 1949 or 1950, Abrams, who had learned from my parents that I had already begun to circulate in the orbit of New York’s young Communist movement, did his best to warn me about the ethics and true nature of Stalin’s regime. As we all walked through the streets of beautiful Cuernavaca (now a famous tourist resort), my parents spotted the painter David Alfaro Siqueras, one of the founders of the Mexican muralist school. The famed artist approached Abrams to say hello, and much to my shock, Abrams refused to shake his hand and exchange greetings. “I don’t talk to murderers,” he shouted at Siqueras, and turned and walked away. When he had calmed down, Abrams told me about Siqueras’s role in the attempted murder of Leon Trotsky at his estate in the Coyocan suburb of Mexico City, when the painter led a group of machine-gun-toting raiders in a failed effort to kill the exiled Bolshevik. Abrams often socialized and became friends with other exiles, despite occasionally severe political differences. 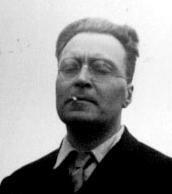 He was a regular guest at Trotsky’s walled-in compound, where the two played chess and argued about Bolshevism. After his death, Trotsky’s widow presented Abrams a set of Trotsky’s favorite Mexican-made dishware as a remembrance of their solidarity and friendship—a gift which Abrams later passed on to my parents. Often in later years, I would serve cake to my Stalinist friends on these plates, and after they admired the beauty of the design and craftsmanship, I would tell them whose dishes they were eating from, and watch them turn pale. Abrams also befriended the great painter Diego Rivera, who spent his years moving from Bolshevism to Trotskyism and back to official Soviet Communism. Despite these twists and turns, and probably because at critical moments Rivera had opposed Stalin, Abrams maintained the relationship. Once, he took me to meet the artist and watch him paint the murals—some of the last he was to create—in the Del Prado Hotel in the main part of the city. In later years, the hotel would cover the murals with curtains because of embarrassment about their anti-Catholic and revolutionary themes. Rivera gave Abrams some of his paintings, one of which Abrams gave to my parents. My mother kept it in her New York City apartment. 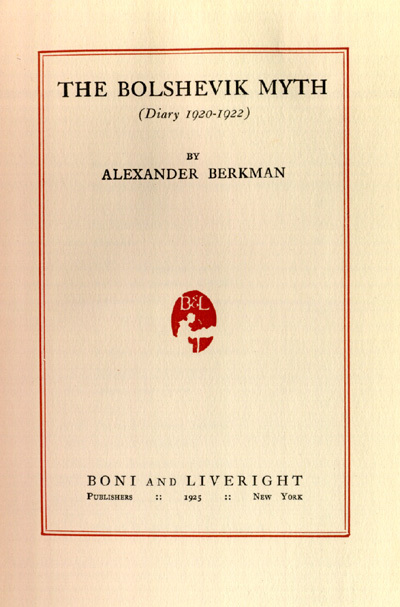 Abrams gave the twelve year old Radosh a copy of Franz Borkenau‘s The Spanish Cockpit, presenting the anti-Stalinist view of the Spanish revolution and civil war. Further reading: Abrams, Jack. J. Aybrams-bukh dos lebn un shafn fun an eygnartike perzenlikhkayt. [Jack Abrams Book, The Life And Works Of A Peculiar Personality] Mexico City: Centro Cultural Israelita de Mexico, 1956. 329pp [via YAB] If anyone has this, and wants to write a guest post based on it, please get in touch! 1. The Popular Front has been one of the great dead ends of the socialist movement. Today, a terrible version of it has emerged in the NO2EU electoral front in the UK, an alliance of Stalinists and Stalinoid trade union hacks with the most reactionary Little Englanders, with a smattering of anorak left groupuscules to give it some hard left legitimacy. Reminiscent of some of the dangerous alliances created by the Communist Party of Great Britain in the 1930s, when they allied with reactionary war-mongerers simply because they were anti-Nazi. Yourfriendinthenorth neatly analyzes No2Eu here. I’m happy to see that Max Dunbar has now joined Anne Applebaum, William Grimes, Adam Kirsch and others in helpfully rubbishing Nicholson Baker’s Human Smoke for being an ahistorical apologia for pacifism. Baker’s efforts at redeeming pacifism’s ill-deserved reputation in the context of the Second World War appear to follow exactly the same lines as Mark Kurlansky’s Nonviolence: Twenty-Five Lessons from the History of a Dangerous Idea, which I was happy to rubbish a while back. George Orwell was there, of course, long before us, when he noticed that pacifism is “a bourgeois illusion bred of money and security.” Will I still be able to refer approvingly to Orwell’s many expressions of contempt for the bourgeoisie if the Liberal Party proceeds with granting the CHRC its greater powers? You have to read the whole post for that last sentence to make sense, so please do. 3. The pacifist tradition that Baker and Kurlansky inherit is not an ignoble tradition. In the UK, its home was, for many decades, the Independent Labour Party. I have a lot of respect for the ILP and its heritage. Ken Coates is the contemporary figure who probably most represents the political tradition of the ILP. Over the years I’ve been influenced considerably by Ken Coates, his humanist socialism, his advocacy for workers’ control, his sense of industrial democracy as an extension of the republican liberties fought for by the likes of Tom Paine. However, in his little magazine, The Spokesman, I have long noted an unpleasant drift towards sloppy conspirationist thought, anti-American hysteria, a “New World Order” mentality. Habibi at Harry’s Place nails this trend, and shows how it spills over into very unpleasant antisemitic territory. Well, here we go. Not very spring-like, I know. YouTube here, last.fm here, homepage here. Mother of all our joys…. I was tempted to pick “The Sick Bed of Cuchulainn”, some of the backstory here. Quickly, quickly on a lost course. YouTube/Last.fm; MySpace. Everyone knows this I guess. It’s a bit too ubiquitous, on loads of TV ads, but it’s still great. I wanted to pick something by Woody, as I’ve been listening to him a lot recently. Browsing through YouTube, I found a slightly lame Klezmatics version of “Mermaid Avenue”, some live footage of “Ranger’s Command” from 1945, and “All You Fascist’s Are Bound To Lose” with Sonny Terry from a (WWII-era?) radio show. However, “Hard Travellin'” is the Woody song I first fell in love with, many years ago. Lovely summery Spanish guitar from my favourite post-punk proto-glitch outfit. On album Vini Reilly. Included in a great playlist here. I’m tagging: Renegade Eye, Fat Man on a Keyboard, Terry Glavin, Francis Sedgemore, Hak Mao, History is Made at Night and (why not?) Nick Cohen. Following Terry Glavin (linked here) and the Fat Man (linked here), Rosie Bell has a really good response to Julian Barnes’ recent NYRB George Orwell essay. Among other things, like the Fat Man she addresses his appeal to libertarians and conservatives of various sorts. An example of the appropriation of Orwell by the right comes from this post at an American anti-Obama blog. 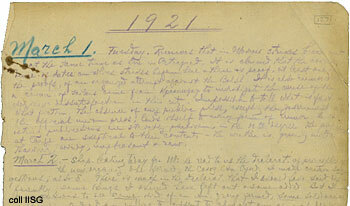 The post is entitled “It was a bright cold day in April, and the clocks were striking thirteen.” This, of course, is the opening passage from Orwell’s amazing novel 1984. Compelling graphics show a Soviet American flag and Obama as Big Brother. Of course, it is a serious abuse of the concept of totalitarianism to think of Obama’s mild reforms as totalitarianism: there is no similarity between what Orwell observed the Soviet dictatorship doing and what Obama is doing. This Thomas quote is, I am fairly sure, a fabrication. If you google it, the hits all come from right-wing sites: over 54,000 hits. Malicious editors, usually anonymous, attempt to write it into Thomas’ wikipedia article, from which it is quoted by lazy bloggers as if everything in wikipedia is a fact (e.g. Standing on Truth, Moose Tracks, DaveGJ, and (slightly more intelligently) Kempite – to list those who have added to the myth this week alone). Naturally, a thorough researcher would try to find many other such books, from people of various political bents, to build a case that such a quote is either probable, possible, or unlikely. One would think such a striking quote would make it into biographies of Thomas; try the tables of contents and indexes for “Liberalism”, etc. Even statements from social and political historians (who claim to have looked for such a quote) can help build a case for or against it. The right uses this fabricated “quote” to substantiate a double lie: that American liberalism is somehow socialism in disguise, and that socialism is by definition a form of totalitarianism or tyranny. The fact that Norman Thomas was a democratic socialist, who fought hard against all forms of totalitarianism or tyranny, not least the Soviet dictatorship, is utterly lost on them. The fact that American liberalism has, at most, called for mild forms of state regulation and never for any kind of socialisation of the economy is also, of course, lost on them. *Footnote: Thanks to Bilber and Kathy for link to hoax-sniffers Snopes who are still “undecided” on the authenticity of this quote. That’s how Principia Dialectica kick off their tribute to Bob Doyle, the last of the Irish to fight against Franco in the Spanish Civil War, who died on Valentine’s Day. Will Rubbish and Shiraz Socialist have also paid tribute. A comradeship of heroes was laid. They came to stand beside the Spanish people. Frank Ryan’s men came from the other side. As the battle for Madrid it thundered on. Brotherhood against the Fascist clan. Apparently, it was written while he was in Spain, reading from a book by Michael O’Riordan, The Connolly Column. As a child, the “International Brigade” conjured up the noblest form of heroism. 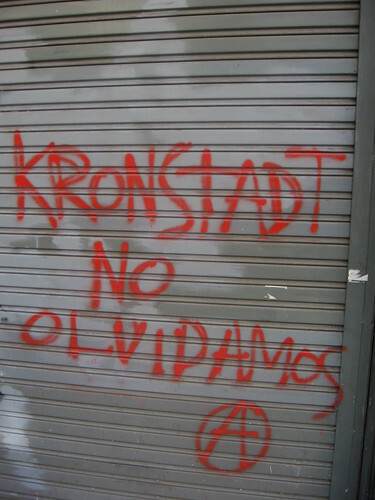 As I got older, and developed politically, I came to see the ignoble side of the International Brigade, its use by Moscow to destroy dissident forms of anti-fascism in Spain. I realised things were not as black and white as fascism versus anti-fascism. So the passing of people like Fishman touches me in another way too: the tragedy of noble impulses used so wrongly.